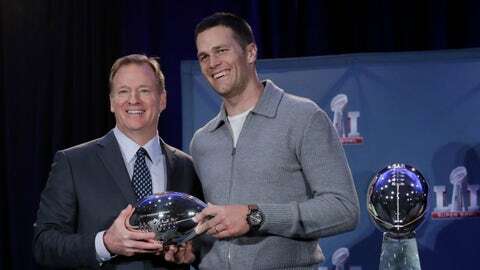 In handing New England Patriots quarterback Tom Brady Super Bowl LI's Most Valuable Player award, NFL Commissioner Roger Goodell called Brady one of the greatest players to ever play the game. If those in attendance were looking for awkwardness between the two, there was none. Goodell, of course, suspended Brady for the first four game of this season for his role in deflating football before the 2015 AFC Championship Game against the Indianapolis Colts. Brady said that he thought running back James White deserved the MVP honors. Brady, who won the award for the fourth time, was 43–62 for 466 yards with two touchdowns and one interception, while White caught a Super Bowl record 14 passes for 110 yards and a score and also ran six times for 29 yards and two more scores, including the game winner in overtime after the Patriots came back from 25 points. “It's just a great team performance. For me to be part of five championship teams is a great feeling because I've been part of five great teams,” Brady said. Brady also confirmed that his game worn jersey was stolen from the locker room.